How do I Use Teamable Slack App? What Benefits does it Provide? Integration with Slack allows you to receive all important notifications directly to your Slack account and interactively respond to those right from Slack without having to browse Teamable app. Employees can receive Intro Requests from recruiters and respond to those. 2. Recruiters can receive referrals from employees, review those and approve/reject. 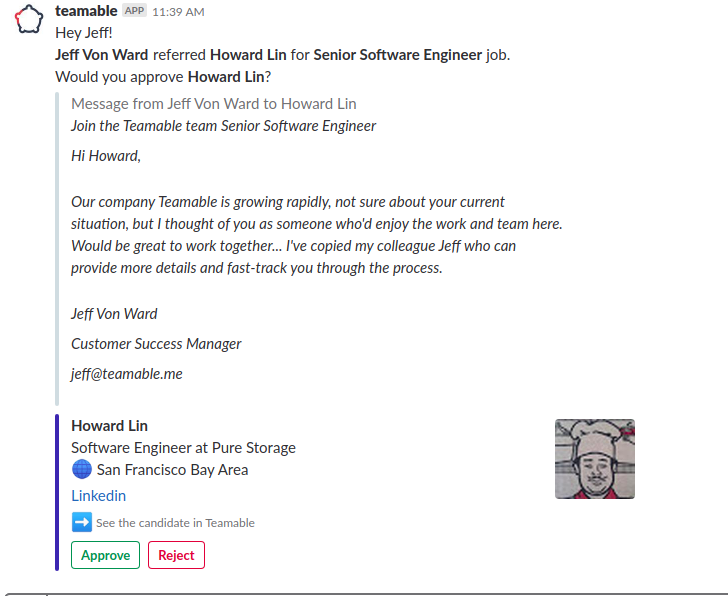 The email composed by employee to candidate is also included in the Slack notification message to provide the full information for making the decision. 3. Users can reply to notes where they are mentioned written about candidates. 4. Please note that after taking the action the message dynamically changes showing your action result as shown in below example. We are always trying to match your Slack ID with Teamable account ID. If you have problems with connecting your Slack account, you can always go to Teamable Slack App, use "/connect" command to connect your Slack account to Teamable. If you do not want to receive notifications from Teamable via Slack you can disable them by going to Notifications tab of your Teamable account settings as shown below.